When the iOS 5 Beta version was released for the developers to test their apps on many of the non Developers like us have gone and upgraded to iOS 5 Beta using some tweak. iOS 5 usage was such a pleasure but after sometime when you realize that you are not able to get network connection which makes it a bi minus point of the Beta Version, that is when you change your mind to get back to the previous version of the iOS that is the iOS 4 which is nearly impossible if you want to do it the official way. So now comes the tricky part you have to downgrade the OS to 4 from 5 but don’t tamper with the Firmware which can be a messy business as it will totally make your device unlockable. First you have to decide which firmware you want to Downgrade your iPhone to and as the next version to iOS 5 is 4.3.3 it surely will be the same. 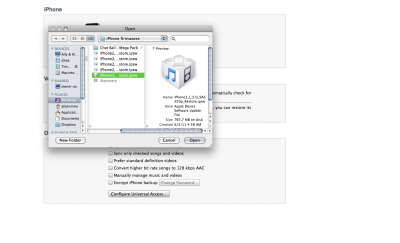 You can Download the Firmware of iOS 4.3 from iClarified where you will be getting the list of Firmwares and you have to select the desired Firmware you wish to Downgrade your iPhone to. After installing XCode on your Mac you have to launch XCode and then open it by selecting Window seen in the list on the Top tool bar and then Organizer which can be seen in the drop down list shown on clicking Organizer. Then you have to navigate to the iOS bundle you’d like to restore to the Firmware you had earlier downloaded to downgrade your iPhone. For some the earlier one can be the Last step and for some their iPhone will be put into DFU mode which we mentioned earlier in the post. If your iPhone has been put into DFU mode then you have use iRecovery software to restore your iPhone to the normal state. Simply run iRecovery after you’d downloaded the libusb files and it should throw your phone out of recovery mode. Now that you are Out of Recovery mode, you can try again and as we have seen after the first error occurs the second time we try it normally gets downgraded easily without any fuzz. Usually this procedure will be useful in cases where iPhone users have upgraded to the latest Developers version of the iOS5 and have finished their licensed time and want to downgrade to the earlier version of the iPhone. It is also useful in cases when people have had enough of the iOS5 without any network connection as there is no Jailbreak or Unlock available because it is the Developers version which is available for download. Apart from this XCode technique to Downgrade from iOS5 to iOS 4.3 there is another tool called the TinyUmbrella, which will be explained in the next post.